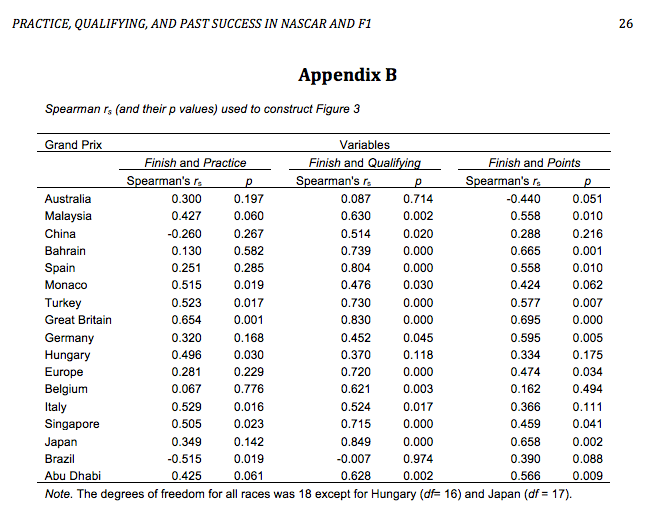 Following directly on from F1Stats – Visually Comparing Qualifying and Grid Positions with Race Classification, and continuing in my attempt to replicate some of the methodology and results used in A Tale of Two Motorsports: A Graphical-Statistical Analysis of How Practice, Qualifying, and Past SuccessRelate to Finish Position in NASCAR and Formula One Racing, here’s a quick look at the correlation scores between the final practice, qualifying and grid positions and the final race classification. 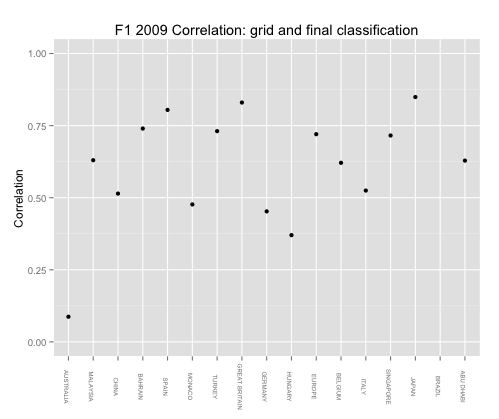 The paper mistakenly reports the grid values as the qualifying positions, so if we look down the grid.int column that I use to contain the correlation values between the grid and final classifications, we see they broadly match the values quoted in the paper. 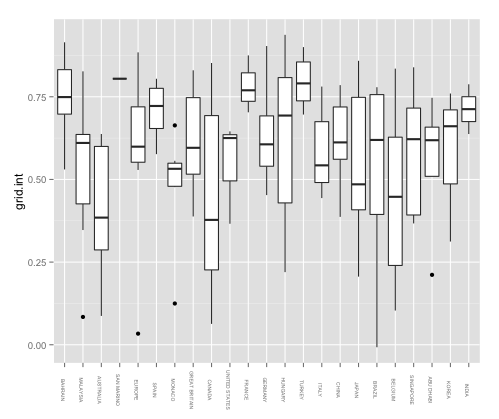 I also calculated the p-values and they seem to be a little bit off, but of the right order. Recalling that there are different types of rank correlation function, specifically “Kendall’s τ (that is, Kendall’s Tau; this coefficient is based on concordance, which describes how the sign of the difference in rank between pairs of numbers in one data series is the same as the sign of the difference in rank between a corresponding pair in the other data series”, I wondered whether it would make sense to look at correlations under this measure to see whether there were any obvious looking differences compared to Spearmans’s rho, that might prompt us to look at the actual grid/race classifications to see which score appears to be more meaningful. 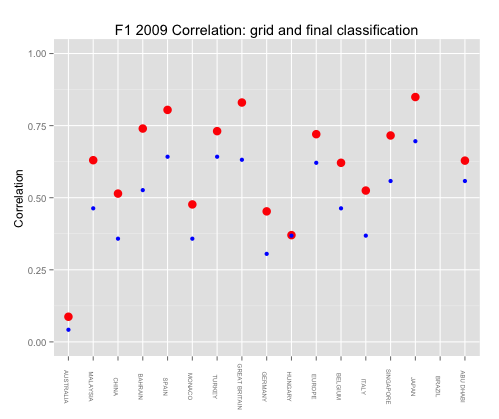 One thing that did occur to me was that I have access to race data from other years, so it shouldn’t be too hard to see how the correlations play out over the years at different circuits (do grid/race correlations tend to be higher at some circuits, for example?). How predictable have the years been, year on year? From a betting point of view, (eg Getting Started with F1 Betting Data and The Basics of Betting as a Way of Keeping Score…) it possibly also makes sense to look at the correlation between the P3 times and the qualifying classification to see if there is a testable edge in the data when it comes to betting on quali? 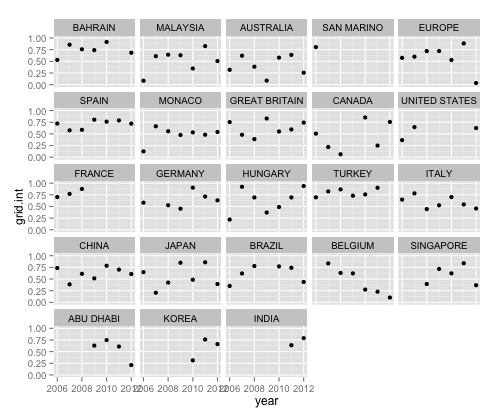 To leave a comment for the author, please follow the link and comment on their blog: OUseful.Info, the blog... » Rstats.